UNCLE TONOOSE: Hall of Fame induction, Nutley, N.J.
Hall of Fame induction, Nutley, N.J. The next time you watch that Christmas season film "It's A Wonderful Life" you should try to picture small town life in good old Nutley, N.J., about one hundred years ago. By that time, future screenwriter, author and Pulitzer prize winner Frances Goodrich was already under the spell of our little town. 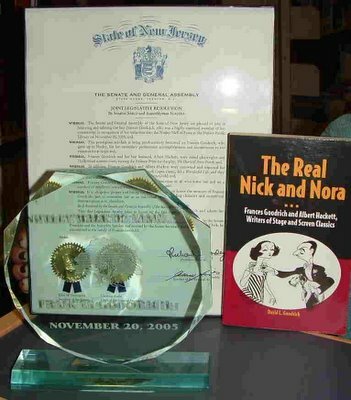 As her nephew David L. Goodrich wrote in "The Real Nick and Nora ..."
"She was born on December 21, 1890, in Belleville, New Jersey, then a pretty village on the Passaic River, where, her mother wrote, "sturgeon leapt and lawns ran down to shining waters." ... the family moved to nearby Nutley, an equally pleasant village within easy distance of New York ... 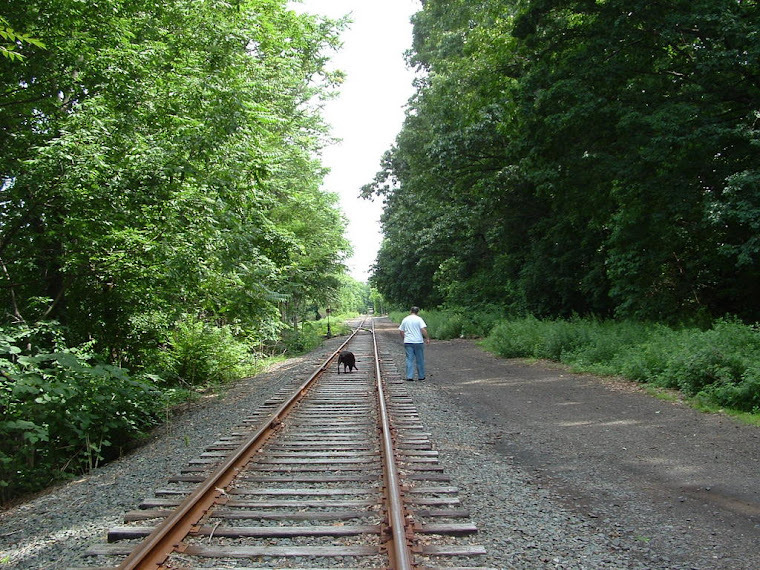 In Nutley, there were green fields, tree-lined roads, big comfortable houses, and another stretch of the clear, unspoiled Passaic...."
Okay, so maybe good old Nutley has changed somewhat. But much of the small town spirit is still here, and the next time you watch Frank Capra's film classic "It's A Wonderful Life," watch how many of the small town references apply to good old Nutley. You see, by the 1940s, the screenwriting team of Frances Goodrich and Albert Hackett had enough hit shows under their belt that Capra called for them to fix the shooting script for "It's A Wonderful Life." The Goodrich filmography is infused with many of the good things about growing up in Nutley. You just have to look for them. 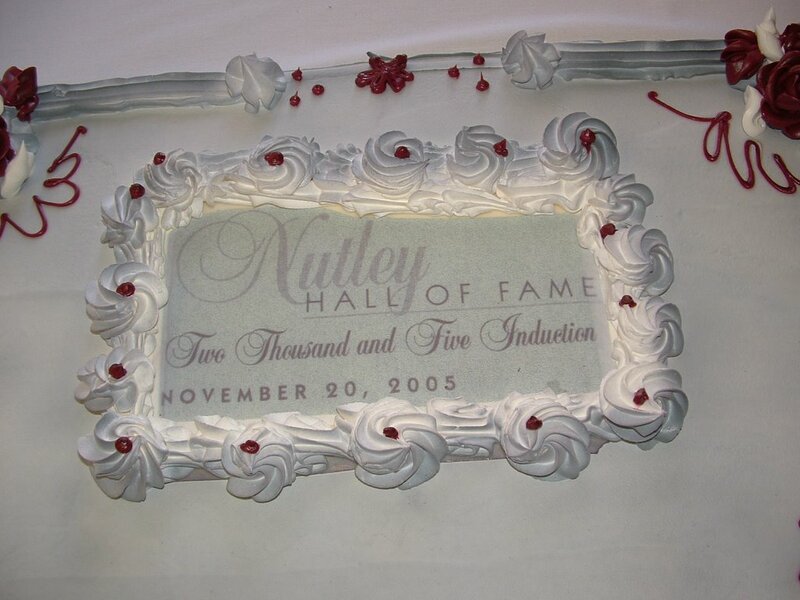 On Sunday, the northeastern New Jersey township of Nutley inducted into its Hall of Fame two Pulitzer Prize winners: Frances Goodrich and Paul Goldberger, and eight other Nutleyites of amazing achievement. 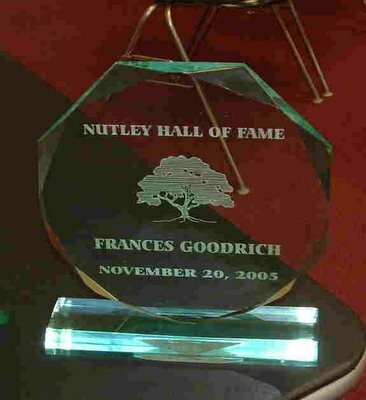 Through myriad twists and turns in the past few months, the family of Frances Goodrich, when told that she would be inducted into the Nutley Hall of Fame, and being unable to attend the function, designated yours truly to accept the award on their behalf. Apparently the family thought that one writer accepting an award for another writer was fitting. For my part, I was asked by the HOF committee to say a few words on behalf of Ms. Goodrich, her family and her achievements. So, through David's comprehensive book I once again tore, looking for nuggets that would enlighten and capture the dynamic spirit of Frances Goodrich and the talent that erupted when she teamed up with husband and partner Albert Hackett. Funny, I thought, after all my visits to the Nutley Library, this was the first time I was wandering the back rooms of the second floor. In the second-floor corner overlooking Vincent Place and Yanticaw Park across the macadam where the colorful downed leaves have fallen onto the hill rolling down to the Third River, we looked around the room, at the audio books on the shelves, at one another, no one really sure what to say to the other inductees. This back place and the awkward talk among people getting to know each other reminded me a bit of that Twilight Zone episode where several characters were trying to get out of some sort of barrel. Those characters didn't know how they got there or where they were or where they were going. 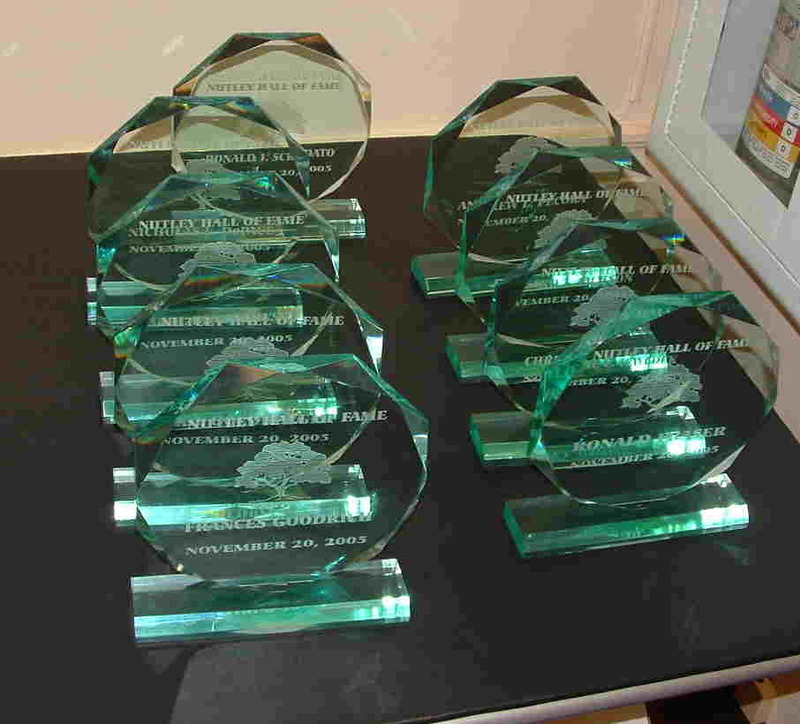 Face it, if we scanned the press release about the event, we pretty much were trying to make sure they got all the info about ourselves right, and while we were greatly impressed with the credentials of the other awardees, it wasn't like we memorized the salient facts and recorded their profiles on the hard drive between our ears. We had an advantage over the Twilight Zone characters, we all knew where we were and why we were here. Although we didn't know much about each other, in the next hour or so, we'd know plenty. And, as it turned out, my short chat about Frances Goodrich and her ties to Nutley were the first that the crowd would enjoy. On behalf of Frances Goodrich and her family, thank you for inducting this deserving person-ality into the Nutley Hall of Fame. I’m sure she would have been honored to be so honored. 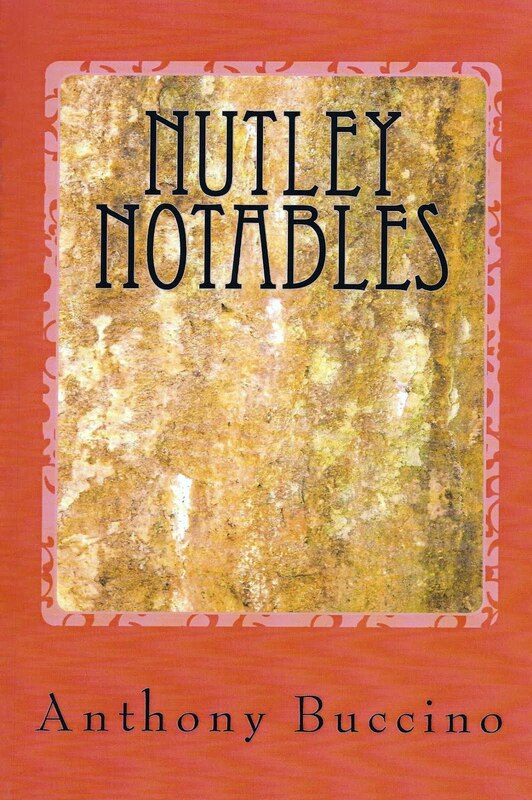 The posthumous awards for Reginald Marsh and Frances Goodrich will be put on display in the library along with notes and other items from the 2005 Nutley Hall of Fame induction. Copyright © 2005 by Anthony Buccino, all rights reserved. Commentary and observation is soley that of Anthony Buccino and does not reflect the Hall of Fame judges, administrators or honorees or their families. Buccino is greatly honored to have been asked to represent Frances Goodrich and her family in the ceremony.